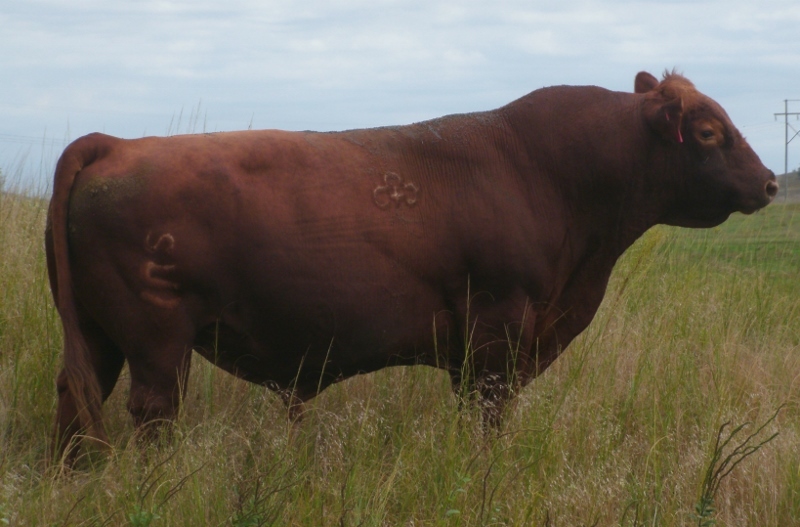 Proudly presenting a Red Angus herd bull battery strategically designed and intensely bred for marbling, fleshing ability, calving ease and fertility. Leachman EBV 6703 (reg. 194921): The original marbling and birth weight trait leader. Legendary, consistent and sire of easy fleshing efficiency. These are the best sons from “EBV” that we’ve seen. “King” (reg. 1244528): Ridge EBV KING 8015 is out of a typical easy-fleshing EBV cow and 5L Norseman King. Offering his first & second crop and they are awesome! Exactly what we aim to produce. “1215E” (reg. 826675): Cains EBV Man 1215; One of our first and best EBV sons out of a “Ladiesman” cow that produced ‘til she was 15 years old. I always considered her my ideal type of cow. “3068E” (reg. 1654390): Cains EBV Man 3068; 100% Cain bred. A true example of what we are trying to produce; efficiency, production, disposition and balance. An “A” type with great EPD’s. Combines: EBV, Logan, Iowa and Ladiesman! “6133E” (reg. 1655141): Cains EBV Man 6133; 100% Cain bred by 3068 and double bred Logan, Three generations of Cain breeding, excellent fleshing ability and disposition. Glacier Logan 210 (reg. 372629): A High Accuracy marbling Trait Leader and sire of ultra productive females. The sire of many of our Top cows. “6803L” (reg. 1107635): SOR-JAG Brick Yard 6803S; “Lancer” is a top son of Lancer 442T out of a Logan cow ownd by Dr. Jim Gosey, one of my breeding program mentors. Structurally sound, low BW and high for both Marbling and REA. Owned with Schuler-Olsen Ranch. “2036L” (reg. 930293): Cains Heavy Logan 2036; “Gordo” 100% Cain bred and the ideal type for us. A grandson of Logan out of an ultra excellent “Hobo x Heavy Wt” cow. Excellent disposition and a perfect example of a large “A” type. “1183L” (reg. pending): Cains Logan Man 1183; 100% Cain Bred out of 1215E and a Logan daughter that calved in the herd until she was 14 years old! BJR Make My Day 981 (reg. 411482): High Accuracy marbling trait sire and extreme birth weight to yearling weight spread. Using his top sons on EBV daughters. “1068M” (reg. 826653): Cains New Day 1068; a Make my Day son out of a Canyon/Quantock cow, a heifer bull with milk, marbling and style. “2062M” (reg. 930363): Cains Lucky Day 2062; a Make My Day son with marbling and fleshing ability out of our most solid cow line. “028M” (reg. 711190): PSR My Day King 028; one of the first Make My Day sons to prove himself, out of a Glacier Northern King cow. Sire of some of our most productive cows. CA Future Direction 5321 (reg. 12493607): A BLACK bull that changed the direction of the cattle industry forever. We have used only AM Negative tested sons for outcross genetics from this landmark sire. “5314B” (reg. 1051957): Basin New Direction 5314; a calving ease, marbling, REA outcross Trait Leader by “Future Direction” AND a Breed Top in marbling!!! “1045B” (reg. pending): Cains Direction 1045; out of 5314B and a 1068M cow. Cain bred, combines performance spread, gain, conversion and that thick “A” type. Nolin’s Rob Roy 324 (reg. 1086671): “ROY” is an eye-catching son of Red Northline Rob Roy 122k, the 2002 Canadian National Champion and 2003 U.S. National Senior Champion Red Angus Bull & also the sire of the National Champion “Roy Rogers”. Roy is phenotypically ideal plus he combines low birth weight, high growth potential and an A++ disposition.